Bead, Beadelle® Galaxy Collection, resin and silver-plated "pewter" (zinc-based alloy), turquoise blue, 12x10mm rondelle with 5mm hole. Sold individually. Item Number: H20-A2336MB Have a question about this item? This large-hole pavé bead, part of the Galaxy Collection by Beadelle®, is fully covered with turquoise blue resin cabochons. 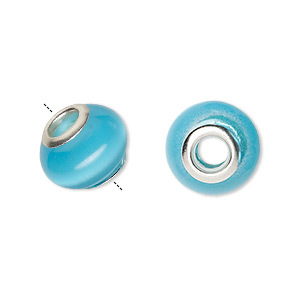 This bead showcases a shining silver plating over a "pewter" (zinc-based alloy) base, then is given a clear anti-tarnish coating. 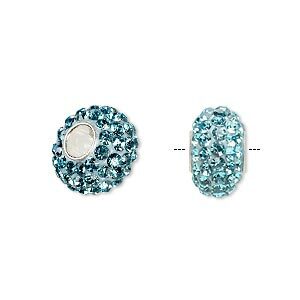 Every resin cabochon is securely glued in place to maintain quality sparkle. 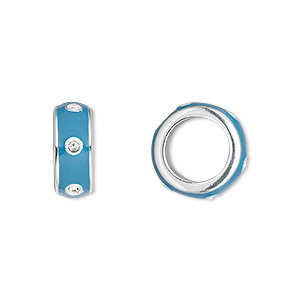 Bead features a 5mm hole, allowing for easy stringing on a variety of cording and ribbon. 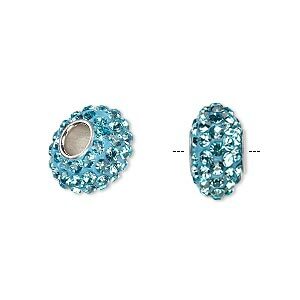 Bead, Beadelle® Galaxy Collection, resin and silver-plated "pewter" (zinc-based alloy), turquoise blue, 10x9mm rondelle with 4.5mm hole. Sold individually. 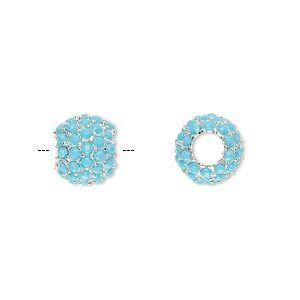 Bead, Beadelle® Galaxy Collection, glass and silver- finished "pewter" (zinc-based alloy), turquoise blue, 14x13mm rondelle with 5mm hole. Sold individually. 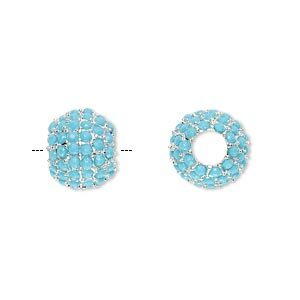 Bead, Dione®, Czech glass rhinestone / epoxy / sterling silver grommets, turquoise blue, 14x8mm rondelle, 4.5mm hole. Sold individually. 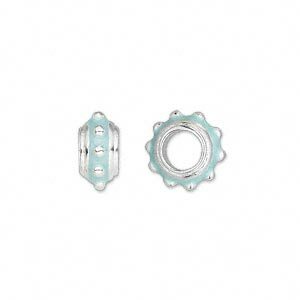 Bead, Dione®, silver-plated "pewter" (zinc-based alloy) and enamel, light blue, 12x6mm beaded rondelle with 5mm hole. Sold individually. 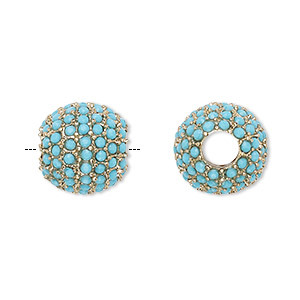 Bead, Beadelle® Galaxy Collection, glass and gold- finished "pewter" (zinc-based alloy), turquoise blue, 14x13mm rondelle with 5mm hole. Sold individually. Bead, Dione®, enamel / Swarovski® crystals / silver-plated "pewter" (zinc-based alloy), light blue and crystal clear, 14x5.5mm rondelle with 9.5mm hole. Sold individually. 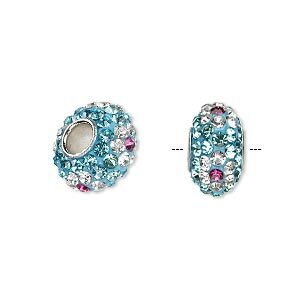 Bead, Dione®, enamel / Swarovski® crystals / silver-plated "pewter" (zinc-based alloy), blue and crystal clear, 14x5.5mm rondelle with 9.5mm hole. Sold individually.